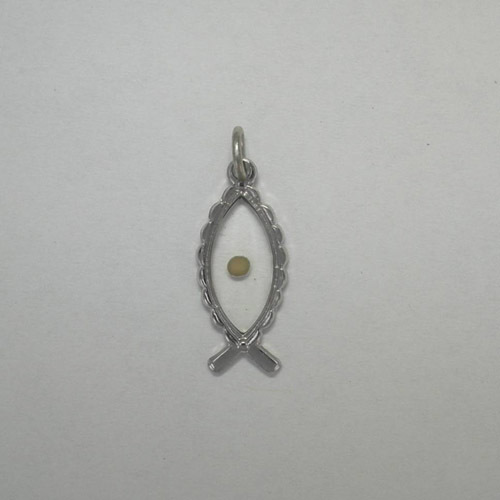 Desc: Sterling Silver Ichthus with Mustard Seed pendant. The body of the Ichthus is Sterling Silver and is open in the center. One Mustard Seed is mounted in the opening held by acrylic. The sides of the Ichthus are scalloped. The pendant has a bright polish finish. Matthew 17:20 If ye have faith as a grain of mustard seed, ye shall say unto this mountain, Remove hence to yonder place; and it shall remove; and nothing shall be impossible unto you.